The Pierre Auger Observatory is named after famed physicist Pierre Victor Auger (1899–1993). He discovered the air showers generated by the interaction of high-energy cosmic rays with the earth’s atmosphere, making possible the study of these particles. In addition to his contribution to the study of cosmic rays, Auger spent most of his professional life exploring other areas of experimental physics, including the photoelectric effect and the phenomena associated with slow neutrons. Pierre’s father was a chemistry professor who passed on his passion for scientific discovery to his son. Auger was a student at the École Normale Supérieure in Paris from 1919 to 1922. He then joined the chemistry laboratory at the University of Paris, where he began his studies on the photoelectric effect under the tutelage of Jean Baptiste Perrin. In 1926, Auger received his doctorate in physics from the university and, in 1927, was named assistant to the Faculty of Sciences of Paris and, at the same time, adjoint chief of service to the Institute of Physico-Chemical Biology. He was named university lecturer in physics in 1937 and was later chair of quantum physics and relativity of the Faculty of Sciences. During World War II, he joined the Free French Forces and helped create an international group on atomic energy research, becoming head of the department in Montreal. At the end of the war, he served as director of higher education of the Faculté des Sciences of Paris from 1945 to 1948, where he established the first chair of genetics at the Sorbonne. From 1948 to 1959, he directed the department of mathematical and natural sciences at UNESCO. Auger was also the first director general of the European Space Research Organization, founded in 1964, and one of the forefathers for the CERN foundation. Auger was elected as member of the French Academy of Sciences in 1977. He hosted a long-running science show on public radio in France from 1969 to 1986 titled Les Grandes Avenues de la science moderne. 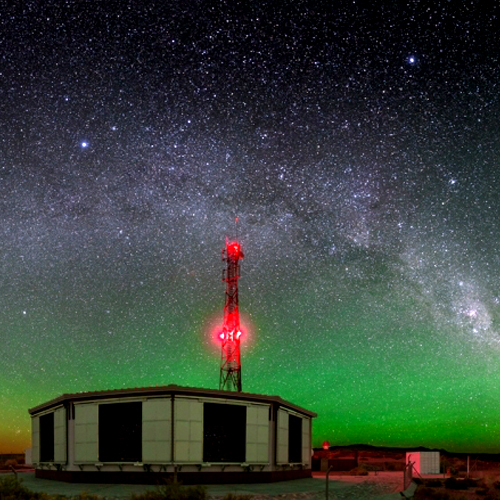 Learn more about the Pierre Auger Observatory.